Many people have discussed what type of a contract Prince Fielder should get this off season. The debate seems to hover around Fielder’s weight and whether the 27 year old will age well through a long term contract. The most analysis on the subject seems to be about how heavier baseball players produce as they age compared to a player with a leaner build. I think that the subject could be a lot easier to analyze because of Prince’s father, Cecil Fielder. Since Cecil was also a large power hitting professional baseball player and they share the same bloodlines, we could assume that the father and son will age similarly. So how did Cecil Fielder produce through his career? What does this mean for Prince’s production? Well if Prince ages like his father and doesn’t get injured, he should remain in his prime until he turns 33 years old. However Prince Fielder is a much better hitter than his father was, and could have some productive years after his prime as his power fades. According to http://www.fangraphs.com Princes value averages out to $22.3mil over the last three seasons with an average WAR of 5.1. With Prince being worth over 5 wins a season and the value of a win currently sitting around $4.5mil. The production that Prince brings could be worth around $23mil over the next 5 seasons and then start to fade from there. With Prince’s production at the plate and the value he adds to players around him in the lineup, I could see an American League team offering a little over $20mil a year to Fielder for 7 years and getting their money’s worth. The Mariners appear to be the only American League team that is in the running for Fielder and having a DH spot to place him in a couple years should make them to feel safer adding more years to a contract. This entry was posted in 1B, Cecil Fielder, DH, Mariners, Prince Fielder and tagged 1B, Cecil Fielder, DH, Mariners, Prince Fielder, Value, Weight. Bookmark the permalink. 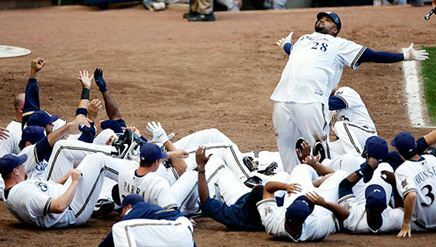 8 Responses to What is Prince Fielder’s worth? The “value he adds to players around him in the lineup” is zero. None. Nil. You are describing an impossible conundrum. There is no such thing as protection, protection theory is 100% bunk. Remove this piece of think from your brain and trample it because it’s a misconception, and when assessing a baseball player’s value you want to make sure that no misconceptions can stand in the way of a clear valuation. To review: the presence of Player A can not possibly affect the value of Players B/C because, obviously. I would like to read some research on this if you know of any. I can understand that you wouldn’t currently be able to calculate a value and add it to a contract offer, but to say that a pitcher/catcher combo doesn’t calculate how to face a batter and that the person on deck doesn’t come into the equation is a tough thought to process. I have always heard (not necessarily from reliable resources) that the batter before the big bat got a higher percentage of fastballs and strikes. I guess I have some research to do. I am with you on this one. Last year Jose Bautista was walked once for every five plate appearances. If Fielder was hitting behind him it is my opinion that he would have seen a significant increase in pitches over the plate. Well said. Ray’s argument is illogical and based on no supporting points. Zero. None. Nil. I don’t think he deserves more money for making other players better, but Prince would certainly help the other bats in the lineup (not by a huge margin, but still…). Let’s say Smoak hits 3rd and Prince hits 4th. Smoak will not be pitched around–he will get pitches to hit (last year, he was the only threat in the lineup in April-May, and was noticeably pitched around to get to cleanup hitter Adam Kennedy). So yes, players CAN enhance the value of other players. That’s common baseball knowledge, Ray-Ray. Ray, this is not ussmariner.com. You are allowed your opinion… just remember it is all opinions here. I don’t think any of us really knows the answer, so feel free to debate. And that is where we begin. I completely disagree with the statement that Player A can not possibly affect the value of Player B. For instance, even in the most basic stats ie, Runs or RBI, the team around you will affect the production level. As you get into more complete stats, this valuation still runs true. As for the protection theory, I would love to see if there is analysis for how a hitter is pitched with different players behind him. And since you have such a definitive stance on this theory, I would love to see the research on it. Nice post! I think that is about where we will see Fielder get paid. Though it wouldn’t shock me to see an NL team pay him that if the majority of the value is in the first 5 years.